The Academy borders an existing 22-acre lake which affords an attractive view of water from most any location within the campus. 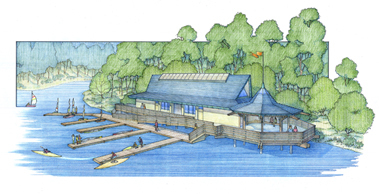 In addition, the lake presents a recreational and sporting component for students and faculty, which led to the creation of a Boathouse. The Boathouse is essentially a 3,000 sqft. storage warehouse on an elevated platform at the edge of the lake, containing an assortment of canoes, kayaks, sailboats and their related equipment, as well as a repair facility. It is rectangular in form with a venting ridge skylight running two-thirds the length of the building. At the exterior, an octagonal platform anchors each end of the building, with separate purposes. The west platform contains a covered pavilion with seating areas for gazing over the lake. It is suited for individual relaxation and group socializing, as well as viewing activities and events taking place out upon the lake. A broad deck runs the length of the Boathouse and connects with the opposite octagonal platform at the east end. This platform is intended primarily for boat launching and outdoor instruction. At water level is a system of floating docks for accessing and berthing the boats.